Further to my recent articles on the front snap kick, I thought I’d go through some of the finer points of how to do it. I hope this will be especially useful to beginners since this is the sort of information I found very useful early in my career. 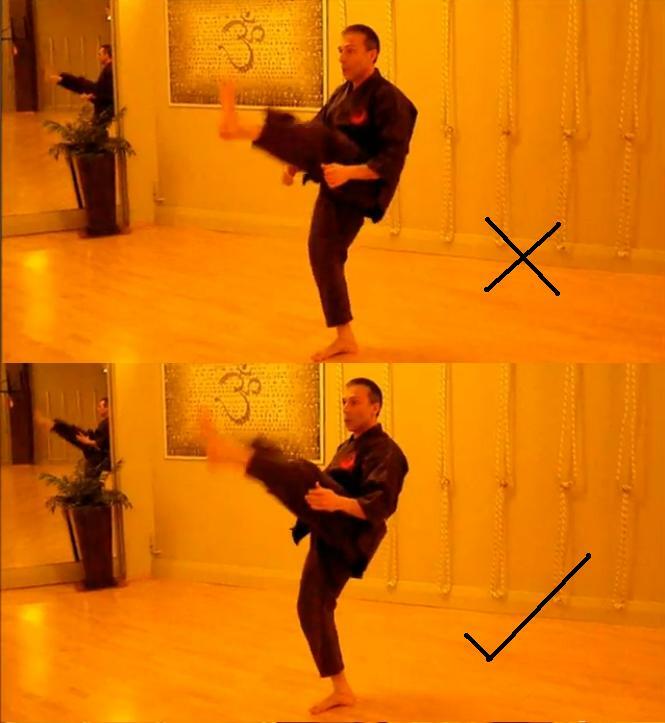 In fact, I still have these points in the back of my mind every time I practice front kicks. I think it is important to keep trying to attain the unattainable - the perfect front kick, free of any extraneous movement before, during and after the technique. Why is technique refinement so important to the front snap kick? to make your front kick as efficient and economical as it can be so as to maximize the force applied to your target. There is a high premium on both of these. First, you don’t want to telegraph your technique at the best of times. The issue only gets more urgent when you are standing on one leg - as is the case with a front (or any other) kick. The last thing you want is to have your kick miss, and then have your relative lack of balance exploited. I should know: I once kicked with my right leg and missed, had my leg caught (on the retraction) near my ankle, then suffered the indignity and pain of having my entire leg rotated inward (anti-clockwise). I tried to ride the movement but it was too quick; my body simply couldn’t keep up. Before I knew it my knee had passed the point of no return and was badly twisted. I limped on that leg for the better part of a year. But things could have been much worse. Then there is the question of force. In my article “Enter the front snap kick” I discuss how the front kick is not particularly forceful as techniques go. I believe that it is for this reason that the front snap kick has often been ignored by combat sports practitioners. On the heavy bag it feels almost insipid. And true, it is not a very powerful technique; it relies on correct timing, placement and distancing to work properly. What this means is that you need to work extra hard at making it efficient, thus squeezing the most force out of the movement. Inefficient technique - where you have extraneous movement - will not only make your technique slower and less effective, but it will also increase the chances of your kick being evaded or deflected. And, as with telegraphing, you might just end up with your relative lack of balance being exploited - in the worst possible way to you! 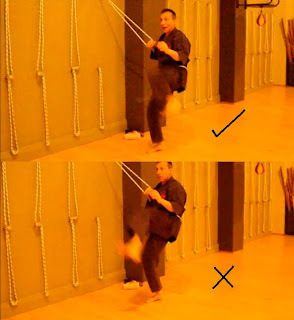 In order to refine your kick, you need to eliminate any telegraphing and other extraneous movement. I’ve found that the best way of doing this is to kick slowly while using a support. I hold onto the ropes we have on our dojo walls, but you can use practically any other support - a door handle, a chest-high wall, a piece of gym equipment, etc. Just find something you can hold onto tightly. Next, kick out slowly, trying move only those parts of the body that you need to move - ie. trying to isolate the kick. Once you can do the kick well with the support, start letting go and trying the kick without it. When trying to refine your kick, practice at a slow, even pace (more on the evenness in a minute). Only once you are able to kick efficiently and economically should you speed up your kick to ¾ speed and eventually full speed. Why? Speed masks errors: I recall my later father and I watching a karate demonstration where a girl kicked a head height mae geri with slow, deliberate precision. I scoffed, saying: “I can kick better than that. Look how slow she is.” My father replied: “Anyone can do it quickly. Can you do it slowly?” The answer, at the time, was “no”. I’ve never forgotten that lesson. The flip side to slow kicks is that you develop strong core muscles and stability, which is not only good for your technique but it is also excellent for your health and well-being. You’ll note from the previous pictures that I am taking great care to keep my height even. This is the first, and most obvious, error made by beginners. Bobbing up and down as you kick is a major indicator of the fact that you don’t yet have “full” control of your movement. Not only is this bobbing uneconomical (and therefore inefficient because you are wasting valuable time and energy in an unproductive movement, leaving less to be transmitted into your target) but it is also a fairly obvious telegraph. Some people rise just before they kick. Others “crunch up” a little. Some do a bit of both (start with a rise, then crunch). A good opponent can and will read that rise/crunch and react to it appropriately, dealing with your kick before it has even properly commenced. So you don’t want to bob up and down: You don’t want give your opponent any cues at all as to what you’re about to do. And you don’t want to waste precious time and energy in unproductive movement. Earlier on I referred to the time I had my leg caught during a kick. It wasn’t caught on the outward journey, but rather on my retraction. Many beginners (and some more senior martial artists!) will snap out appropriately, but when it comes to snapping back they only do it about half-way, dropping their foot casually forwards, or using a raking back motion. This is dangerous. It might be hard to catch a kick when it is going out, but it isn’t nearly so hard going back. If anything snap, your kick back faster than you snapped it out. I wish I’d followed his advice all those years ago - my knee might not have become as problematic as it has. Here is another common error, albeit not one that many instructors pick up: Students need to be aware that the speed of their movement is even throughout the technique. There are no points where one should slow down. If you are performing your kick slowly, then the whole kick should be slow. If you’re performing your kick fast, then the whole kick should be fast. The most common error is in this regard is where the student does a fast snap out, then pauses in the chamber (on one leg) for a brief second before putting his or her leg down. This is a very bad habit to get into. You must get your foot back on the floor as quickly as possible. The last thing you want is to be facing your opponent standing on one leg. 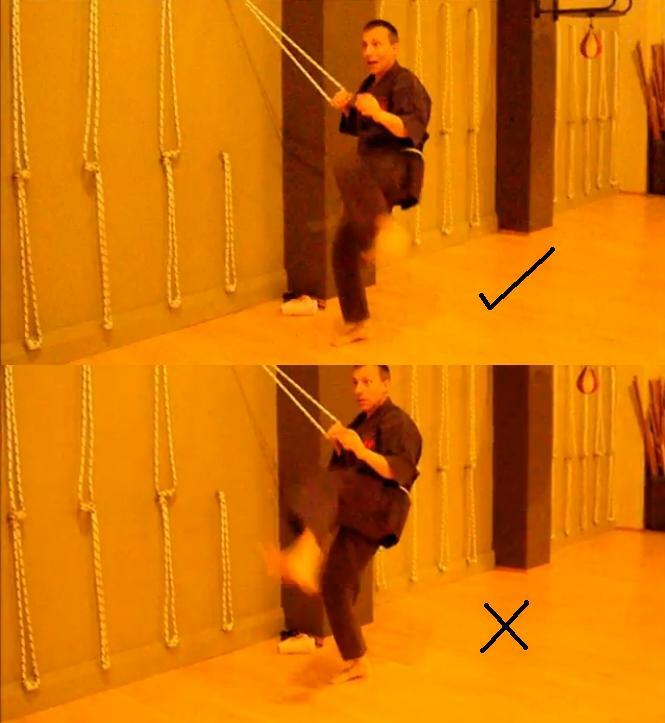 The second most common mistake is a slow movement to chamber before the kick, then a fast kick out, and then another slow movement back down from the chamber (ie. a “slow, fast, slow” sequence). The same issue arises here as with the previous example, except you’re also giving your opponent plenty of warning that you’re about to kick. Thankfully, this mistake is rare. But if you’re doing it, then for heaven’s sake, stop! If you need any proof as to the need for a quick outward kick and quick return to the ground, look at the examples I provide in my article “Enter the front kick”. Note how each of the practitioners kicks "out of nowhere" and then drops his foot back onto the ground immediately. The adjacent images of Justin Bucholz are directly on point. Last, in your quest for avoiding extraneous movement don’t forget what it is you’re trying to do. You want a powerful kick, not an insipid one. Don’t get so caught up in maintaining even height, snapping back, maintaining even speed etc. that you sacrifice practicality. It’s one thing to kick without extraneous movement - it’s quite another to kick without necessary movement. One such “necessary movement” is to be found in your hip. Your hip needs to push forwards into your opponent. If it doesn’t you won’t be putting your body into your kick - only your leg. The front snap kick is one of the simplest - yet hardest - techniques in the traditional martial arts arsenal. What do I mean by this? 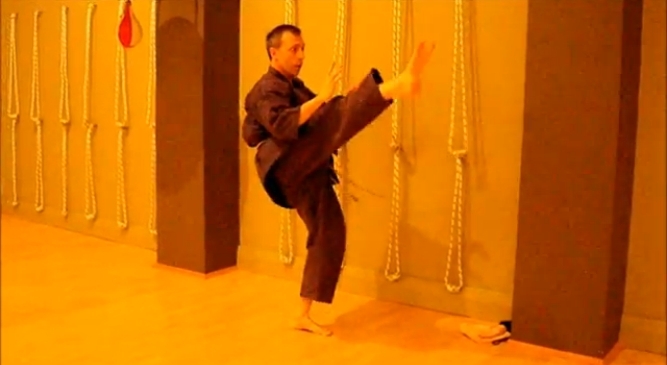 The front kick is a simple movement, yet it is not one we tend to do in everyday living. We are more inclined to do movements akin to the “soccer/football” kick than a movement approximating the front kick. Accordingly, it comes as no surprise to me that many eclectic/combat sports martial artists eschew the front snap kick, preferring the more familiar roundhouse kick using the shin. The latter has its place in martial arts, that is true. But the suggestion that it is “faster” and “more effective” are manifestly false. A huge, sweeping roundhouse kick is going to impart more force. But it will be diffuse over a larger surface area. Moreover it will be highly telegraphed and take a relatively long time to execute. By contrast, the front snap kick is not as “forceful”. But it has the advantage of being a far more direct movement. After all, the shortest distance between 2 points is a straight line. 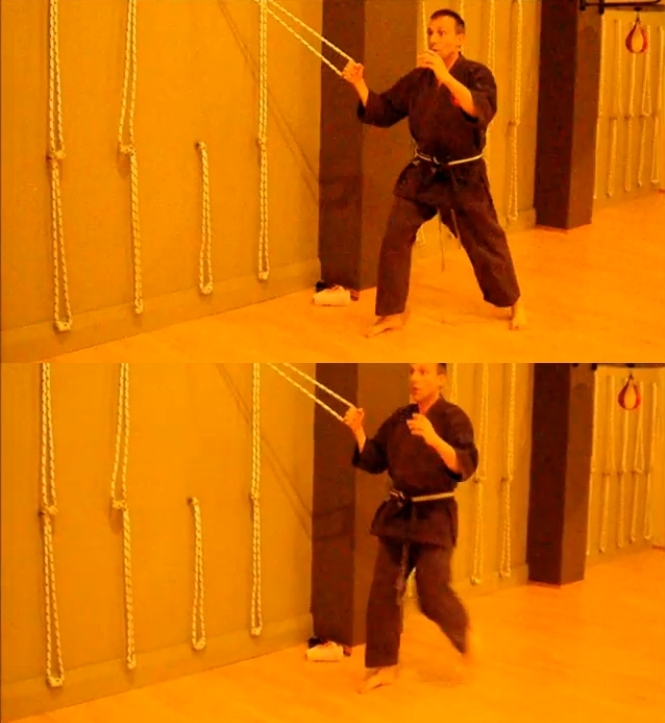 Your front snap kick should be geared at making that line as straight and unwavering as possible. Your support structure needs to be solid and any extraneous movement before, during and after needs to be eliminated. If you can manage this, I’m confident that you will find (as I have) that it is the “king of the melee”; it can come out of nowhere, find its mark, and return to the ground - all in a tight space not much larger than a telephone box and in a timeframe that is a fraction of any other kick. This is of vital importance to any kick used in a civilian defence environment. Get it right and it can work wonders. Get it wrong and you might as well go back to the roundhouse kick using the shin. there is not a single point I can argue against in this post. It kind of makes me sad, though. In the organization with which I am afiliated, we encourage our students to begin teaching relatively early on. However, my experience is the quality of these teachings is not qc'd as much as it should be. My point here is that I can remember being taught almost all of your "don't" do points as "do" points. It has taken years of observation, seeking out and plan old trial-and-error to be where \i am now (and yet so far to go). And STILL I find informtion in your post to help light the path for me. We obviously had a similar karate "upbringing" Dale! Thanks for your kind words - they are greatly appreciated. Thank you for elaborating on your previous "back to the basics" snap kick post. Your scientific approach to martial arts is a breath of fresh air from all the "realist" teachers out there. I have a question. I have almost no background in martial arts (one year of wrestling), and I would like to learn some for general self defense. I am not a very strong man, although I have pretty good control. After extensive research, it seems that japanese jujutsu is well rounded for self defense, with some techniques for striking, holds, and defense against handheld weapons. What is your opinion of japanese jujutsu, and what do you think would be a good martial art for me to look into? My opinion of jujutsu is high. I suggest you go along to various schools until you find one that "feels right". As with any martial art, much depends on the teacher, the other students, the atmosphere, etc. It might feel right in the first place you walk into, or it might take a bit of searching. Good luck! Thank you, I respect your views a lot, so this will be a great motivation. I am a nidan, and have recently noticed that when sparring other black belts they pick up on the tiny bit of weight shift I do to my front leg immediately before a front kick. It's by far my favorite kick, and I've been working on it almost exclusively for over a year in order to increase it's speed and power, but against skilled enough opponents it's still not good enough. Do you have any recommended exercises for training yourself mentally/physically to shift from a neutral fighting position to a kick without doing a slow (comparatively) weight shift right beforehand? I definitely don't bob up and down, it's just my front knee and top of my leg that they can see tense up. Use a support and do the kicks slowly, taking care to eliminate any weight shifting or other telegraphing before hand. Do 10 on one leg, swap to the other and repeat twice more before increasing speed and letting go of your support. Do this every session. It is the only way.